A Mokum Film release of a Zeppers Film presentation of a Zeppers Film, Ikon production. (International sales: Deckert Distribution, Leipzig/Icarus Films, New York.) Produced by Frank van den Engel. Executive producers, Jorinde Soree, Judith Vreriks. Directed by Jessica Gorter. Written by Gorter, in cooperation with Beatrijs van Agt, Marieke van der Winden. 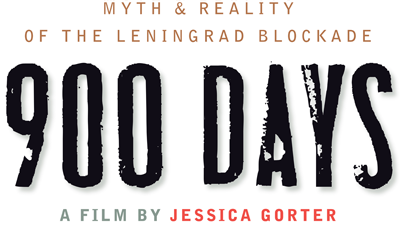 After the title "900 Days" appears onscreen, helmer Jessica Gorter adds: "Myth and reality of the siege of Leningrad." It's the perfect description of this superb docu, which captures in 77 deeply troubling minutes the contradiction between the official version of a heroic populace persevering for the Motherland, and the private bitterness of a people disgusted by the way the Soviets and their heirs avoid questions of responsibility. Beautifully lensed and expertly edited, this throat-gripping look at history and its continuing ramifications won the top Dutch docu prize at IDFA. Since then, the docu has played a limited number of fests, though it deserves greater exposure. A 58-minute version exists for smallscreen runs, yet there's no need for a shorter cut when the full-length pic hasn't an ounce of fat and can easily be slotted into schedules. Boutique docu houses should take a look before inevitable TV sales preclude theatrical play. Since her debut with "Piter," also about residents of St. Petersburg, Gorter has sharpened her vision, finding meaning in every shot, and using the camera as silent commentator. Here, she turns her clear-eyed gaze on the Blockade of Leningrad, where more than 1 million people died during the Nazi siege of 1941-43 (the subject of what was meant to be Sergio Leone's last project). Part of the docu's success comes from Gorter giving her handful of interviewees time to become forceful characters rather than mere talking heads. Weaving archival footage among the testimonies reinforces the tragedy, yet it's the words of the survivors now, and their faces today, that haunt. For a blow-by-blow history lesson, it's best to look elsewhere, though auds needn't bring much prior knowledge to understand then and now. People like husband and wife Alexander Fedorovich Zhiglyavski and Zoya Nikolaevna Bulynina make clear their disgust with the official line, which showers them with medals as a way of avoiding any investigation into the state's culpability for the extreme death toll. Stories of people dropping dead from hunger on the frozen streets lose none of their power for having been heard before, though it's the discussion of cannibalism that truly disturbs. Gorter juxtaposes these painful reminiscences with shots of the Russian army today parading the streets in "honor" of the victims of the blockade. The meaningless pageantry and blind celebration contrasts with the life of Lenina Dmitrievna Nikitina, orphaned under horrific circumstances during the siege and now living alone in a faded apartment. Though she knows some think she's unbalanced, her chillingly detailed story makes clear that any perception of madness comes from those unable to listen. Lensing displays a great eye for anomalies, and Gorter doesn't hesitate to point out, via visuals, similarities between the Stalinist regime and the current one; Danniel Danniel's expert editing beautifully integrates past and present. The tragedy of the Blockade is still too great to fully come to terms with on a collective basis, but "900 Days" shows that even grasping the horrors on an individual level is ultimately a task few are capable of comprehending. Camera (color/B&W, HD), Sander Snoep; editor, Danniel Danniel; music, Frank Gorter; sound, Menno Euwe; sound design, Tom Bijnen; line producer, Natasha Nikolaeva. Reviewed on DVD, Rome, June 13, 2012. (In Transylvania Film Festival -- What's Up Doc? ; 2011 Intl. Documentary Film Festival Amsterdam.) Running time: 77 MIN.